Welcome to another Feminist Friday! That part of the week where we sit back and gather around our fave videos of the moment. This week we’re checking out a timely and powerful short film made in response to the horrific terrorist attack at a Mosque in Christchurch, New Zealand, another short film showing the power of hope and courage among young girls in the world’s largest refugee camp, and the trailer to a newly released film showing the cultural impact of ‘Thelma and Louise’ decades on. If you have been following the news over the past few weeks in relation to the New Zealand massacre, you will no doubt have heard about how the country is immediately stepping up to the plate and banning assault rifles, how the Prime Minister Jacinda Arden has been phenomenal in her support for the Christchurch Muslim community by offering to pay for all funeral expenses regardless of immigration status, and generally being the kind of world leader we need to see more of. But underneath all of the news headlines is the ongoing issue of white nationalism and fear of the “other”, especially in the way Muslims are often demonized. In response to times of tragedy, art has often become a way to bring healing and understanding, and this event is no different. 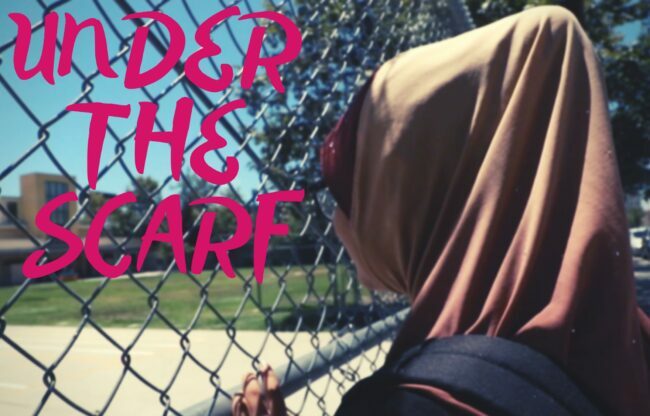 Created by the Global Girl Media and Women’s Voices Now 2018 summer training program alumni, ‘Under The Scarf’ was made as a call-to-action for empathy around a topic that is often misconstrued and stereotyped in the mainstream. Mehrin, like any other teenage girl tries to navigate her way through high school. Once the scarf is on, she’s deemed a stereotype. The short documentary was made by female youth and centers on the idea of being a young woman, a Muslim, and an immigrant in America, seeking identity & inclusivity. The film is also meant to spark discussions with questions designed to challenge and generate empathy, which you can read more about here. Watch ‘Under The Scarf’ and share widely with your network and community. The last video this week is a trailer for filmmaker Jennifer Townsend’s newly released documentary ‘Catching Sight of Thelma and Louise’. Continuing with the aforementioned idea that art has the power to change the world and bring healing, as the title of this film suggests, it takes a look at how a breakthrough film from the 1990’s starring two female leads, a rarity at the time, has had a lasting impact on audiences throughout the years. “In 1991, some viewers who watched ‘Thelma & Louise’ wrote intimate stories about why the film resonated with them. Twenty-five years later, the same viewers share their stories and compare their early reactions to how they feel about the film today. They pose the question: Has anything changed in the way women are treated by the world?” says the description of the film. Created as a way to spark discussion and conversations among groups of not only women, but ALL genders, ‘Catching Sight of Thelma and Louise’ is both timely and relevant as we are seeing more and more pressure on Hollywood decision-makers to break down gender barriers. But as ‘Thelma and Louise’ star Geena Davis often remarks through her Geena Davis Institute on Gender in Media organization, sadly the equality needle has not moved forward in great leaps or bounds. This means there is still work to be done, but as Jennifer Townsend reminds us, films have the power to create change and allow us to see ourselves reflected in a world that can often be limiting. You can visit the film’s website to purchase tickets as it opens in NYC April 5 and Los Angeles April 19. More cities to be added to the screening schedule.